Families Always Talk About the Same things – Advice for Holidays – Find You in the Sun – A daughter's slow waltz with her mother's dementia. Families always talk about the same things, I heard years ago, from a director at another care home, while visiting Grandma-Great Wick. I had driven north from Cincinnati to St. Mary’s spend time with Virginia, Davis’s great-grandmother. 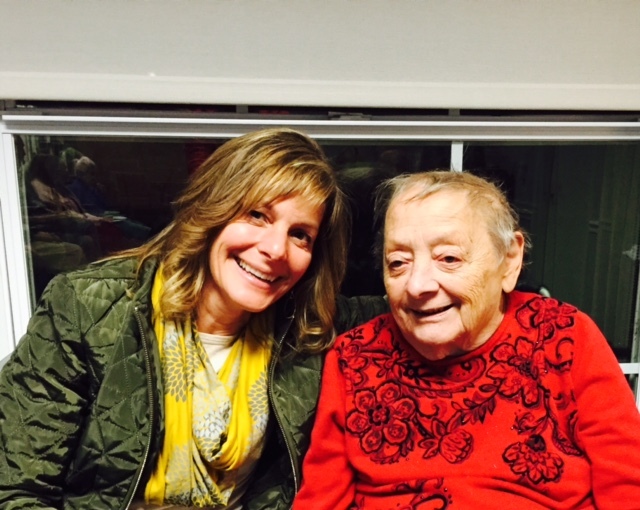 Aunt Lynne had needed support after moving her mother, and I wanted to be there for her. The director made a solid point. For someone whose mind and life happened in slow motion and repetitively, that person probably thought the same about visiting loved ones, thus not always responding in an expected or positive manner. Varying guests, interactions, and subject matter was beneficial to that person, and more so, for the sanity of the family caregiver. His words always ran like a neon ticker in the back of mind when spending time with my mother and were made clear when my husband Mark accompanied me on a visit to Arden Courts one Sunday afternoon. Lately, I had grown tired of Mom, and she of me. Her fall over Halloween had been a physical setback, causing her to spend time in a wheelchair, fearful of another fall, probably in pain, but unable to articulate where. She was often agitated, with little to settle her into a place of peace. In reacting to my presence, she had been what I termed, “rapid-cycling.” When I asked her to do something, she would flat out refuse then flash a Chesire cat grin at a nearby caregiver, for whom she willingly did what was asked. Thus, I brought Mark along to act as buffer. We found Mom seated in the family room, and greeted like her with short, gentle hugs. I allowed her time to adjust. She quickly noted my orange shoes and crinkled up her nose, pointing at them. Her looks could always kill. Mom drank in Mark’s blue eyes and, suddenly, she rose like Lazarus. My husband tossed his head back to laugh. I threw my hands in the air. She had a similar reaction a few nights later, when Arden Courts hosted their annual holiday open house. I arrived to find Mom still at her dining table, seated in the wheelchair. She had been using the walker and I thought we had conveyed to the caregivers to keep her out of the wheelchair. The wheelchair didn’t provide ease for her to rise up or down, because of the brakes and the flexible seat. I slowly came around in front of her, and offered a hug, to which she returned. “What party,” she asked with slight dismay in her voice. “Oh, you’ll like this one,” I said, and began to ease her away from the table. I tried to move her several times, silently cursing, thinking of the thousand other places I would rather be then felt shameful for thinking such things. My heart sank. I finally had to be honest. I had arrived at the junction where the redeeming moments happened with less frequency and the challenging ones more. Becky waltzed into the kitchen, encouraging or gathering up the rest of the residents. She noticed I was having difficulty and came towards us. Becky reached across the table. Mom extended her hands to take in Becky’s then stroked her cheeks. Gradually, Becky coaxed Mom‘s grip away from the table’s edges, while I rotated my mother’s wheel chair. Becky continued to hold Mom’s hands, tugging at them ever so slightly. Mom inched forward in the wheelchair and Lazarus arose once more. Mom and I went on our way, taking longer than usual. Her gait had slowed, and she limped more, probably a breakdown from a replacement hip years ago. There was no rush, because, well, there wasn’t. And the trio of musicians, The Beechwood Players, was still practicing in the outer parlor. Becky had already cautioned that Mom didn’t like to sit next to H. because he couldn’t hear and his questions irritated her, so we passed up open seats next to H. and shuffled towards towards the far side of the room. Breathe. Breathe, I reminded myself. Earlier in the day, I had practiced yoga. While there were yoga poses for insomnia and thyroids, and piriformis muscles and happy baby, there was no yoga pose for obstinate mother with memory loss. I congratulated myself, and Mom, for having been present and survived all three. The evening progressed as the residents were the warm-up act for the Beechwood Trio. Mom made it through the first chorus of Jingle Bells then stopped and mostly observed. My notes were off-key, as if to remind me how my mother still far exceeded my own gifts. Finally, the musicians entered the room and played a steady stream of baroque classics. The notes, instruments and pacing were quite different from the standard Christmas fare and were met with a welcome change. Throughout the course of the event, Mom continued her outbursts, calling out to a guest, “C’mon, let’s go.” She had mistaken him for a musician, as he had been standing so close to the speaker system. When she observed that plates of cheese were being served, and she hadn’t received hers yet, she shouted across the room. Mom wanted everything in an instant. Her outbursts were steady, but because we were seated on the far edge, and music softened the blow, not many guests heard. Her final eruption left me in a puddle. The musicians were playing The Highlands of Holland, after teasing that there were none in that country. We all laughed. When Mom doesn’t understand a joke, she gets frustrated. She saw me laugh and heard the giggles of those around me. I saw irritation written on her face as she Mom grabbed my arm. I was so startled, at first, I didn’t understand. Then, Mom tilted her head towards me, indicating she wanted me to lean in for a hug and to nuzzle our noses and cheeks. So many challenging moments leading to one tender one. The musicians played on. When they played Irish or Celtic music, she turned up her nose. If they mentioned a German tune, she turned up her nose. Finally, I confided, all the songs were Italian, and she settled in to listen to Serenata Amalfitana. When the music stopped and the players packed up, I led Mom back down the corridors. Mom wanted to sit in a sling-back chair that did not allow for her to rise with ease. She yanked my arm towards that chair. “Mom, let’s get to the red door.” I pointed out. “By Becky.” But Mom pulled the other way. “I want to sit,” she said, and I honestly couldn’t blame her, and probably should have just left her there. Then, she spotted Becky. “Well there is Mr. Red Door,” she called out. Becky held out her hand. It was a natural fit for Mom’s. With Mom seated, I leaned over to kiss her goodnight, brushing her cheek with my hand, then brushed a few strands of her hair aside with my fingers. Mom was done with the fuss, had a few more choice statements to make. “Boy, she really gives you a hard time, doesn’t she” Becky observed. Translation: I’ve been here way too often, telling her what to do. Second translation: Family always talks about the same things. Becky and I left Mom and met up with “Uma,” a resident who had been born in Germany. “You looked like you were having a good time,” I said to Uma. As we chatted with Uma, one gentleman visitor was moving a resident’s belongings out. The resident was leaving for skilled care. Another woman was moving her mother there too. Skilled care was obvious next step when the disease took just enough of a loved one, but not enough to leave the world entirely. I helped him out with the belongings, and thought of all the families at Arden that night, who sat, not always willfully, not always lovingly. They dedicated a little piece of their life to be together and dance in the light before we all left, alone, in our cars, back into the darkness. Families do always talk about the same things, and react to each other in the same ways. So, during the holidays, I will happily leave Mom to Becky’s care. I will gladly bring my husband or kids along. For I know, when Mom sees Mark, she sees blue eyes and joy. When she spots my children, she sees youth and fresh air. When she notices Becky, Becky is like a long lost niece. When she eyes her favorite caregiver, her caregiver has no great expectations for her. When my mother sees me, she is first happy then perhaps, reminded of the prison she in, the life she led, the one she cannot remember. Despite the director’s mantra from long ago, I’ll continue to show in the darkness when Mom cannot articulate her anger or pain or wants, or whenever there is singing and dancing, living for that one moment Mom yells at me to lean in so we can hug, because families always want the same things.